Turkmenistan published a law Wednesday spelling out the president's powers and duties - a first for the Central Asian country whose late leader, Saparmurat Niyazov, ruled with an iron fist and built an elaborate personality cult. The law, printed in the government newspaper Neutral Turkmenistan, appears to be a step toward more openness and transparency in the natural gas-rich ex-Soviet republic that, under Niyazov, turned into one of the world's most isolated societies. His successor, Gurbanguli Berdymukhamedov, has scrapped some of Niyazov's least popular policies and has made moves toward greater transparency. However, he has given no sign that he will scrap the country's one-party rule. The newly published law says the president has the right to name the Cabinet, the armed forces' top officers and, with the legislature's approval, the Supreme Court's chief justice, interior minister and prosecutor general. It also spells out the rules for removing presidents, a rule that appeared at aimed at restricting the possibility of future leaders being named "presidents-for-life" - as Niyazov had done for himself. 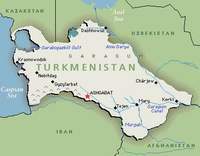 Now, Turkmen presidents can be removed only by the country's parliament, which historically has been a rubber-stamp body. The law also indicates that inauguration ceremonies for new presidents should be conducted along the Quran and the Ruhnama, a book of sayings and teachings that Niyazov penned and made mandatory learning for all of the country's schoolchildren. A spokesman for the presidential press service refused to explain why the law was published on Wednesday, saying: "I cannot comment on this. Read the newspaper, it's all there."